PHOTOGRAPHER: Ashlee is a sought after newborn and family photographer in Indianapolis. She is known for the cozy, relaxed atmosphere of her sessions, and the authentic art she creates. 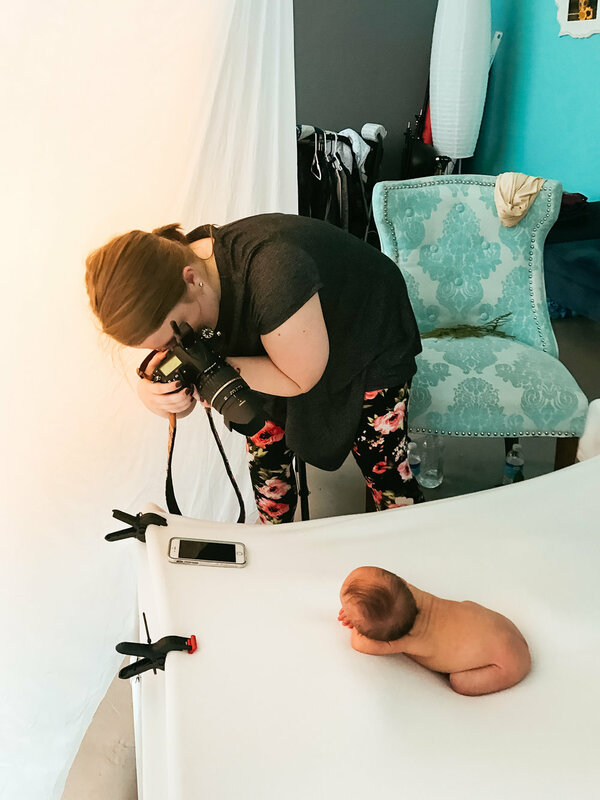 TEACHER: Ashlee is currently expanding her business to offer tools for budding photographers. She believes in encouragement, honesty, and support in the photography community. CURATOR: Ashlee curates and photographs mothers for Project Motherhood, a collection that tells the stories of Indianapolis moms in their own words. OMG! YOU ARE MY SOUL SISTER -- I WANT TO BOOK MY SESSION RIGHT NOW! I STILL HAVE SOME QUESTIONS I NEED TO ASK. I'm a Fort Wayne native transplanted to Indy when my boyfriend, Lucas, got a pretty rad job down here. He's a photographer as well, but is the total opposite of me (I guess we balance each other out). He a photojournalist for a magazine. I have to take a moment to brag about him: he's crazy talented and he's met the president more than once. And he taught me how to use studio lights (true story -- the first day I was in the studio and using lights, I had two sessions lined up. I called him in a near-tears panic after the first session because I could NOT figure out lighting. He came down and helped me with my setup before the next client came in, bless his heart. Hopefully the first client didn't see the terror in my eyes....). I have a sweet, fat, adopted fur son named Dutch. I lovingly refer (or should I say, "refur"? haha....) to him as "Chunk," "Cream Puff," and "Beached Whale." (I know. I'm an evil, evil cat mom.) We all live downtown a few blocks from the heart of the city. Lucas and I wouldn't have it any other way. Dutch doesn't care where he is, as long as there's a sunny window and plenty of treats. Photography is the thing that lights my soul on fire. I love that I'm giving clients something that they will hold onto for the rest of their lives. I love playing with colors and textures for newborn sessions. I love the sleepless nights, when I'm up editing and creating. I love that I can turn ordinary places and things into something magical with my camera. I love that kids go home after a shoot and tell their moms they want to go back and play with Miss Ashlee again. It really is the best job, even though sometimes it's the hardest job, when you have to reach deep down within yourself, to push through all the challenging emotions and struggles that come with a creative life. I love being able to just hang out with my clients at sessions, rather than making sessions a super formal type of thing. Who wants that?? Not me. I want kids to run around and have fun (and yeah, I'll laugh if they make fart noises or say poop). I want mom and dad to relax during their newborn session, and catch up on some adult things (or sleep!!!) while I'm with the baby. I want to leave a session feeling like friends. P.S. I really love cake. It's a bittersweet type of thing. I'm sure you know what I'm talking about when I say that.